Arsenal and Galatasaray are facing disciplinary action after supporters of the Turkish club lit red flares and threw them onto the pitch, briefly holding up play, in their Champions League group match on Wednesday. 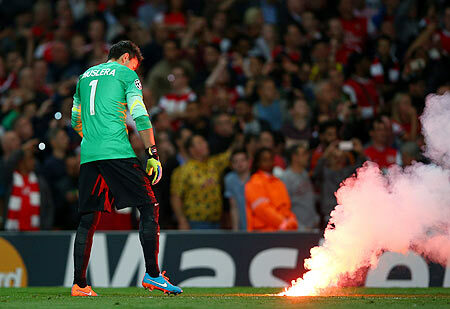 UEFA said in a statement that disciplinary proceedings had been opened against Arsenal for "insufficient organisation" and against their visitors for "crowd disturbances, setting-off and throwing of fireworks" during the Premier League side’s 4-1 win. FC Basel will also be probed by UEFA's disciplinary committee after fans threw "missiles" onto the pitch during their 1-0 home win over Liverpool. The Swiss champions were ordered to play their Europa League quarter-final at home to Valencia behind closed doors last season after their fans caused trouble in a match at Salzburg. Borussia Dortmund were also charged due to crowd disturbances, including the setting-off and throwing of fireworks, during their 3-0 win at Anderlecht on Wednesday. Champions League: Can Arsenal guard fortress against Galatasaray?